Time for Big Boy Bed? I can’t believe that it’s time to think about moving Baby E into a bed. He’s only 16 months! (Not even, just almost 16 months) But, this little guy is our daredevil. He’s fearless and LOVES to climb. He climbs on the couch. He climbs on the coffee table. He climbs on top of the sofa table and his toys help give him leverage. He even tries to climb on top of the piano. What’s a mom to do? Eventually, he’s going to figure out how to climb out of his crib and fall right on to the hardwood floor. This is something that moms have nightmares over. I do. I’m also not really ready for him to have the freedom of unsupervised nightly potential climbing in his bedroom. Moving him to a bed will change his whole sleeping habits and will affect his brother’s sleep. Our boys share a room. So, figuring out how we were going to fit in another bed with the two dressers in their 11 x 10 bedroom posed a challenge. Not only that, but one whole wall has the closet and entry door. One and a half of the other walls has windows. The fourth wall has a built in shelf. Oh so challenging. 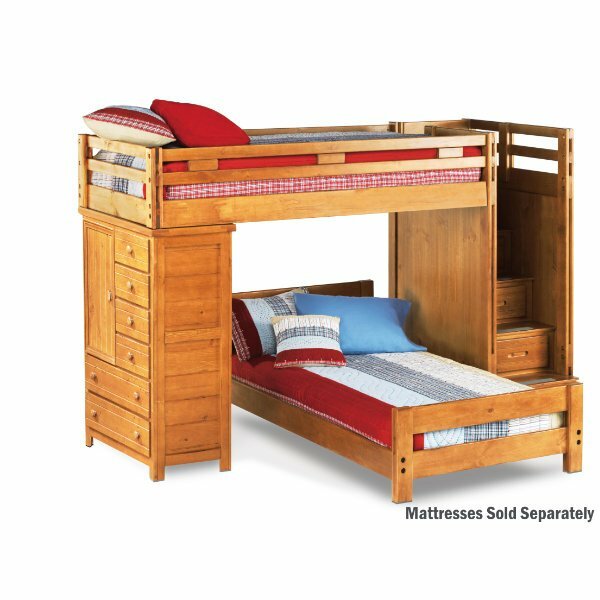 It made sense to go with bunk bed – maximize the floor space, but then there’s the worry about our climber and a ladder – scary! We found a bunk that had steps instead of a ladder. Very cool! It would be much easier to teach Baby E how to safely use steps. So, here’s what we bought – and it was delivered yesterday. It’s huge! We liked that it included a chest so we could take out one of their dressers. We also liked the steps (with storage) instead of a ladder. We also liked the “T” layout of the bed (maybe if someone “slipped” from the upper bunk, the lower bed would be there to catch them). Okay, so now that it’s here. G LOVES it! Of course, he gets the upper bunk. Baby E has navigated the steps several times (up and down – supervised, of course). We currently have the lower bed off to the side and against the wall. We still need to get a mattress. Baby E’s crib fits totally underneath the bunk – great for storage during the day. Soon the time will come where I’ll work with him during nap time to get him to sleep in the lower bed. Then, we’ll move on to night time. Am I terrified that Baby E will try and climb the steps (unsupervised) at night? Totally!! I’m planning on making a “baby wall” to keep him from getting up there. There is a small channel between the lower step and the sides that I think I can fit a piece of wood. I plan on covering it with padding and fabric (to protect the wood from scratching and people from getting splinters). I’ll keep you posted. For now, I’m at peace because Baby E hasn’t even attempted to climb out of his crib (so I have time) but we also have a solution in place. Whew! I’m so not ready!